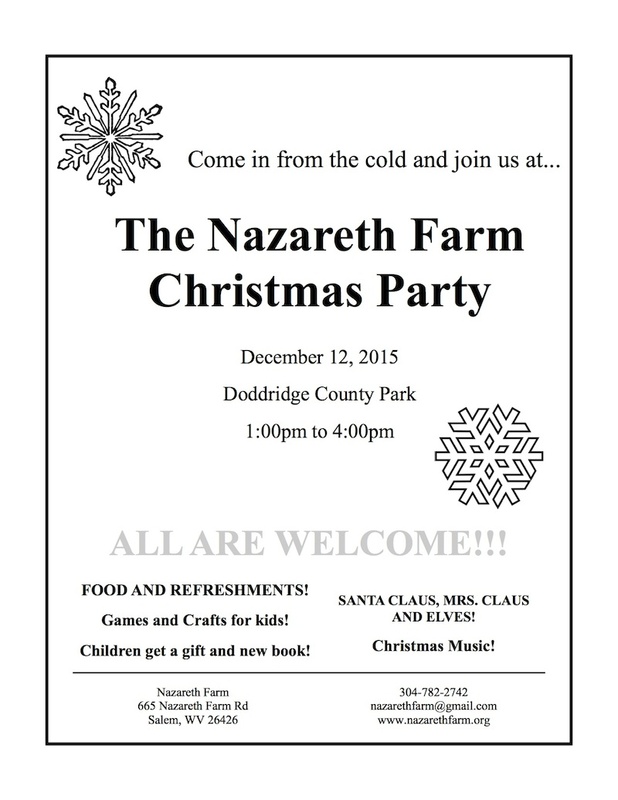 Nazareth Farm will host its annual Christmas Party on Saturday, December 12 from 1:00pm to 4:00pm at the Doddridge County Park main lodge building. The Park is located on Snow Bird Rd, 1.1 miles off US Rte. 50 in West Union, WV. Everyone is invited no matter where they live or how old they are. There will be food, cookies and refreshments for everyone as well as many exciting activities for the kids. Children will get the chance to meet and take a picture with Santa, Mrs. Claus and a real north pole elf! Each child will receive a present from Santa and also a new book. There will also be many games and crafts for all the children. Nazareth Farm is a not for profit organization that transforms lives through a service-retreat experience. We are devoted to living out the Gospel message through the cornerstones of community, simplicity, prayer, and service. We serve alongside our neighbors to address substandard housing by providing home repair. We celebrate the richness of Appalachia and experience God by building relationships between our volunteers and the local community. Our annual Christmas party is a long standing tradition and an opportunity to bring joy to our local community and get to know our neighbors. And to help us all prepare to celebrate Christmas. Please call Brian Suehs-Vassel, the Director of Nazareth Farm if you have any questions at 304-782-2742, or visit our website www.nazarethfarm.org.